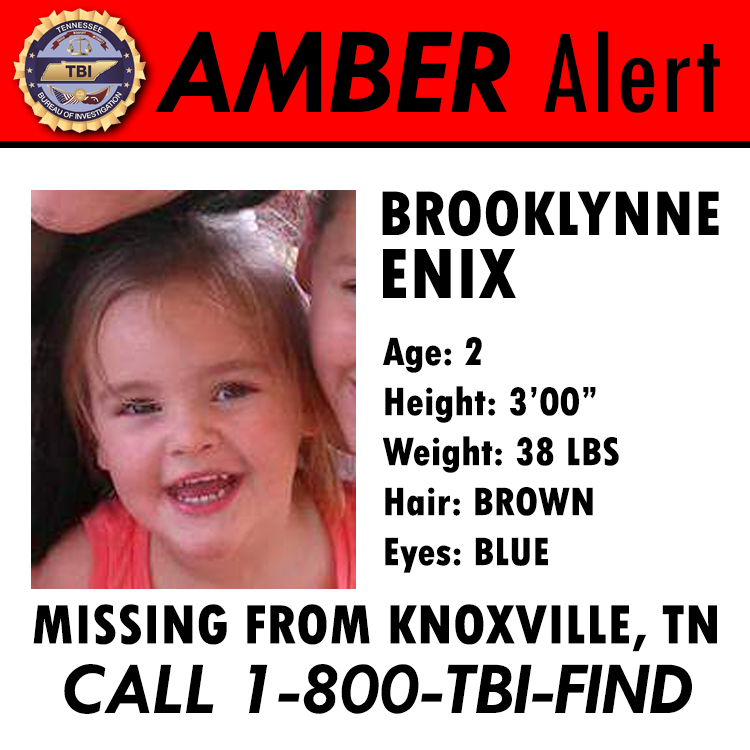 KNOXVILLE – The Tennessee Bureau of Investigation continues to seek the public’s assistance in locating two-year-old Brooklynne Enix, currently missing from Knoxville, Tennessee and the subject of a Tennessee statewide AMBER Alert. Earlier today, officers from Knoxville Police discovered the body of Brooklynne’s mother in her residence. The investigation led the police department to issue a warrant late tonight charging Tyler Ward Enix, Brooklynne’s father, with First Degree Murder. Tyler Enix (PICTURED BELOW) stands 6’2”, weighs 205 pounds and is bald with blue eyes. The 36-year-old has previous arrests for Domestic Assault, False Imprisonment, and Aggravated Assault. His daughter, Brooklynne, is 3’00” and weighs 38 pounds. She has brown hair and blue eyes. The pair may be traveling in a 2011 black, four-door Chevrolet Impala with Tennessee tag G6116U. This evening, after issuing the AMBER Alert, authorities have been attempting to substantiate a variety of tips about the whereabouts of the child and her father. However, their current direction of travel is unknown. If you have seen Brooklynne, Tyler Enix, or the vehicle, please contact the Knoxville Police Department at (865) 215-7212 or the TBI at 1-800-TBI-FIND.